Sanjh is a Blockchain-based content marketplace to license any media content for sharing and broadcasting across OTT and other content sharing platforms. NEW YORK, NEW YORK, USA, April 1, 2019 /EINPresswire.com/ -- NewYork-based leading OTT platform provider Muvi has announced Sanjh - world’s first blockchain-based digital content licensing marketplace that allows buying and selling of media content rights such as movies, music, documentaries, images and much more. Touted as the new eBay for digital content, on Sanjh, content owners can sell their media content licenses to streaming service owners and broadcasters. Similarly, channel owners can buy content license securely from anywhere in the world through Sanjh. 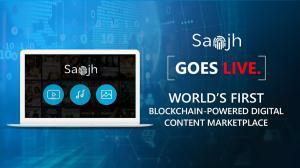 Powered by Blockchain, Sanjh is a one-of-its-kind secure marketplace for trading media content licenses through tamperproof smart contracts. Content owners can earn a higher share of the license fee since there is no involvement of middleman. On Sanjh, content owners can sell all types of content such as movies, series, music, documentaries, images etc. at the desired price reaching media houses and streaming services directly thereby significantly reducing the infrastructure cost. Similarly, buyers can access a vast library of all types of content, verify licenses online, and purchase rights directly from content owners securely at a better price. “With the advent of streaming services, content owners are faced with three main challenges- piracy, unauthorized distribution of content, and opaque royalty payment system, quotes Jyoti Nayak, Senior Marketing Manager, Sanjh. “Sanjh serves as a remedy to all three issues. Firstly, it’s tamper-proof. Powered by Blockchain, Sanjh is armored by multi-layered security levels and prevents piracy. Secondly, it rules out any iniquity in content distribution, since it tokenizes any media assets and operates on a distributed platform where all stakeholders have access to exactly the same ledger records. Thirdly, Sanjh deploys transparent royalty payment by paying content owners immediately upon sale leaving no scope for any middleman in the value chain. In addition, Sanjh makes the content marketplace democratic by subverting copyright infringement and violations”, Jyoti adds. Lauded by customers for its state-of-the-art design and security, Sanjh is all set to break the barriers in the content ecosystem bringing sustainability to artists, streaming services, and media houses alike.